Why do so many women drink and eat to excess and then spend their days regretting it? An expert on women and depression explains what can be done to treat and prevent it. Depression is a common and debilitating problem among women, though it rarely occurs in a vacuum. As Susan Nolen-Hoeksema's original research shows, overthinkinga€”a tendency to ruminate on problems rather than seek solutionsa€”often co-exists with unhealthy eating habits and/or heavy drinking. In fact, 80 percent of women who report suffering from one of those also suffer from another. This groundbreaking audiobook explains how these three core problems reinforce one another, wreaking havoc on women's emotional well-being, physical health, relationships and careers. 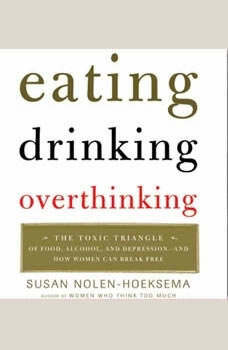 Susan Nolen-Hoeksema shows women how to harness their emotional and interpersonal strengths to overcome the stress caused by a destructive relationship with food, alcohol, and overthinking so that they can fashion effective, healthier strategies for living the life they deserve.